The historic Korenbeurs in Schiedam will get a new role. 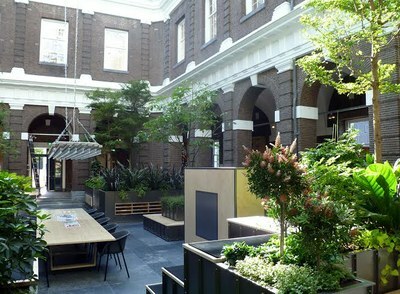 This old building, where grain used to be traded for the Schiedam gin distilleries, has been transformed to house the municipal library. A striking feature is the indoor garden of the library, which can be enjoyed by all visitors. And this is great, because the centre of Schiedam doesn’t have so much public green space. The Korenbeurs is a privately owned building. It has long been the desire of the Municipal Library of Schiedam to move into the Korenbeurs. Preparations for this move were started in 2014 with a quest for a sound concept for a future-proof, accessible library that should be more than just a place where you can borrow books. Several architects were asked to make a plan, based among others on the important condition that the open, glass-covered courtyard was to receive a clear function. Architect Jan David Hanrath, specialised in libraries both new and renovated, was one of the architects to make a design. He built it on two ideas: the idea that a library has a firm place in the heart of society and his conclusion that people in the centre of Schiedam hardly have access to public parks. 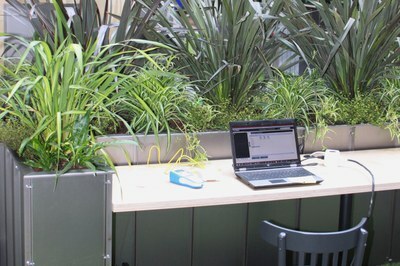 So he planned an interior garden at the location of the working and reading desks, as well as an area that is suited for other activities. His green design was hailed as the winning plan. When you have an indoor space that is covered with a glass roof, you are easily tempted to turn it into a subtropical greenhouse. However, the library consciously opted for a garden with a Dutch look and feel, because the idea was that people want a ‘park just around the corner’. This did pose a challenge. They needed plants that are similar to indigenous trees, in structure and foliage, but thrive in greenhouse temperatures. Besides, they wanted the plants to remain evergreen. 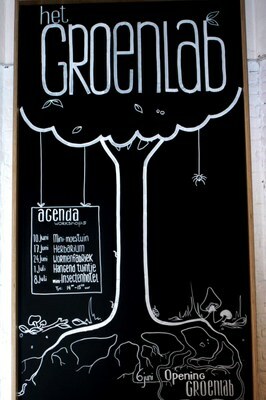 The architect asked Huib Sneep, who lives in Schiedam and is a renowned dendrologist for advice. 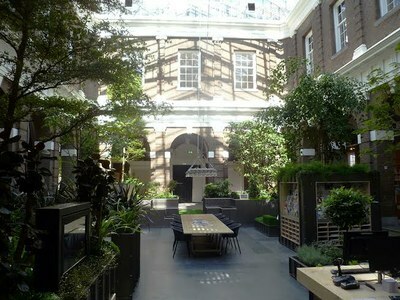 Together with interior landscaping firm Zuidkoop he came up with a plan where large but slow-growing trees, like Ficus, Bucida and Tamarind, were combined with plants and shrubs. They also constructed a vegetable garden with herbs, strawberries, lettuce and rhubarb, among other plants. 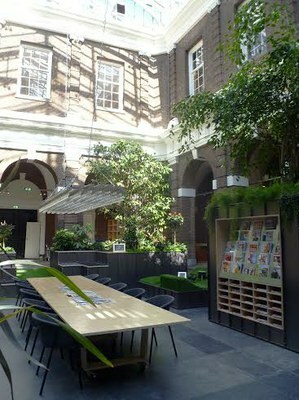 This vegetable garden is used by the café Vol-koren that is also located in the building. The library does not only look green, it is sustainable too. Inside there is LED lighting, bookcases and furniture have been made of recycled cardboard and the air is conditioned by a climate system using top cooling. The plants grow in a semi hydro culture; at the bottom are granules that are covered with a felt mat and topped by potting soil. This ensures the moisture is retained, which doesn’t only serve the plants well but also saves water. Pests are controlled in a natural way using, among others, ladybirds and their larvae. Both the architect and the library felt it was important that the library garden would turn into a place for the people and by the people. The daily maintenance of the garden will be carried out by the coordinators of the library but also by volunteers living in the neighbourhood. These will all be trained by Zuidkoop, whose staff will gradually become less involved, until they tend to the indoor garden once every three months. The children coming to the Green Lab will also work in the garden. This will explain to them how produce is grown. They can also hang their wishes and ideas in a special tree. 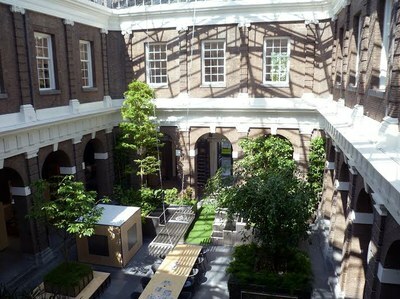 Other organizations from Schiedam are welcome to organise activities in the library or rent a workplace on the top floor. 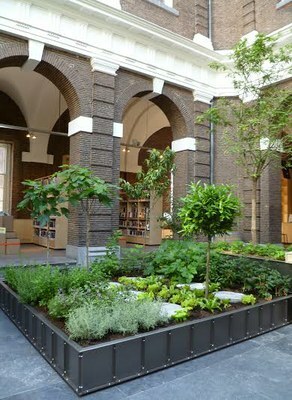 Philosopher Cicero already said it, 2000 years ago: ‘If you have a garden in a library, you have everything you need.’ On 6 June the green library officially opened. The visitors will be able to experience if they can relate to that.